Not sure where I found this bottle of beer, but after having the Dogfish Head Neo-Berliner Weiss, Festina Peche, I wanted to try more of this style of beer. 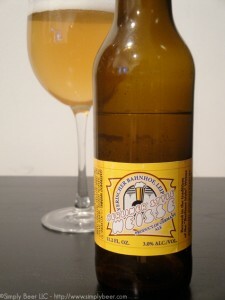 This Berliner Weissbier is brewed in the “traditional Berliner style”. Basically that means that the beer should be a bottle conditioned wheat beer made with both traditional warm-fermenting yeasts and lactobacillus culture. The lactobacillus yeast impart sour or tartness on a beer. Poured a golden straw color with a pretty decent white head, which quickly fizzled. Lots Of tiny little bubbles, almost like champagne. There was a thin layer of sediment at the bottom of the bottle indicating a bottle conditioned beer. 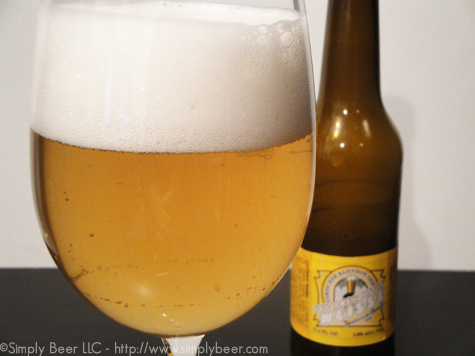 The beer was wheaty with a sour lemon aroma with a hint of honey and bubble gum under it. Not as tart as I was hoping for, but it had a decent lactic acid sourness to the beer. With some sours, that sourness will stick to you teeth, but not this one. The mouthfeel was pretty thin. There was some honey sweetness mixed in with the sour, not much in the way of wheat in the profile. This beer had a decent sour, good entry level sour if you want to try the style. I’m glad I tried this beer, but it’s probably one I won’t go back to. I felt though there was something missing in the beer. I think what was missing was the alcohol!! At the risk of exposing myself as a lush, I won’t usually consider a beer if it has less than 5% ABV. At 3% ABV, this sounds like it was missing the magic ingredient. In all seriousness, alcohol is a flavor in beer that makes it physically and psychologically satisfying. Otherwise you’re just drinking a nice loaf of bread.